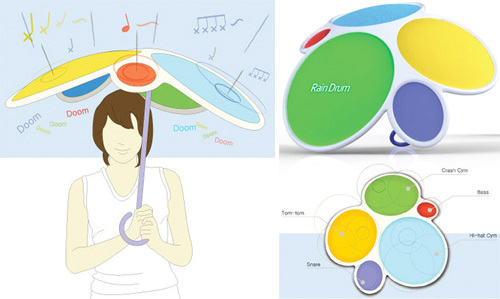 I like the idea behind this Rain Drum umbrella that turns the pitter patter of raindrops into various drumkit sounds. It uses five wax cloth ‘shades’ that each have a different elasticity to produce unique drum sounds as the raindrops bounce off of them. Of course the stiff frame needed to keep the drum skins taut doesn’t look like it folds down that easy, or at all, and the irregular shape of the umbrella as a whole could actually make it kind of tricky to stay dry. But, you can’t fault designer Dong Min Park for his concept that basically tries to create a silver lining for a cloudy, rainy day. By Andrew Liszewski on 09/16/09 • Leave a comment! Oregon Scientific’s new +ECO Clima Control weather station will report the effects of global warming, without contributing to them. It’s the company’s first model to feature a solar panel that’s used to charge the device’s 600mAH rechargeable battery. So leaving it out in the sun for just 8 hours will soak up enough juice to keep it running for up to 3 months. As for its weather reports, it uses a set of easy-to-understand icons like sunny, partly cloudy, rainy, snowy etc. to indicate the current conditions, and it can display the temperature and humidity for up to three different remote locations. (Possibly by wirelessly communicating with other units, or with remote sensors, I’m not entirely sure.) $119.99 from Oregon Scientific. By Andrew Liszewski on 08/03/09 • Leave a comment! 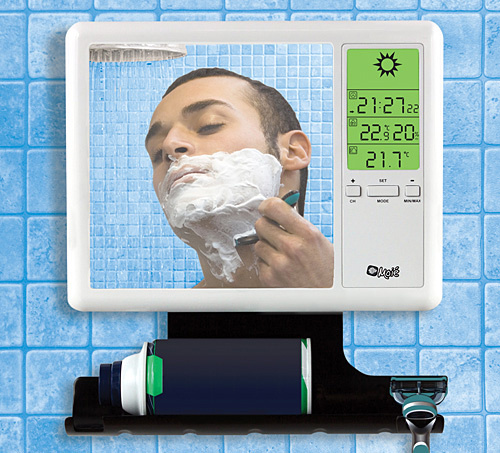 When you’re hacking away at your face with a sharp razor I’d suggest staying focused on the task at hand, but if you’d prefer to multitask and be more productive in the mornings, this shower mirror with a built-in weather station will kill a few birds. The 7-inch mirror has a special fog-free coating so it won’t ever steam up, and it’s accompanied by a high-contrast LCD display which provides updated weather info like current temp, humidity and the day’s forecast thanks to a wireless sensor that can be located up to 100 meters away. $49.98 from Taylor Gifts. I still don’t see the reason why anyone would invest in a standalone weather device when accurate forecasts are available via almost every other gadget on the market, from phones to even the Wii. But the WoodStation manages to somewhat justify its almost $150 price tag since it’s made from a stylish piece of maple or walnut. 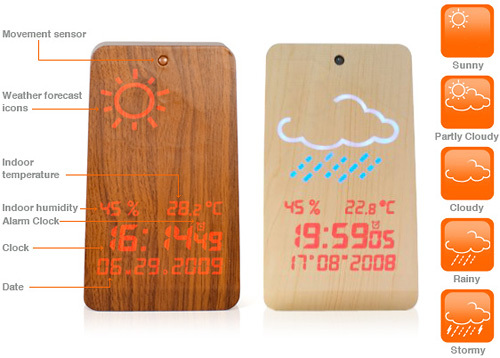 When sitting on your night stand or desk it looks like a small chunk of wood, but waving your hand over the motion sensor causes the face to light up with glowing icons providing information on the current weather, humidity levels and temperature, as well as the date and time. By Andrew Liszewski on 07/02/09 • Leave a comment! Everything I know about golf I learned from the movie Caddy Shack, so while inclement weather can possibly lead to the best round of your life, there’s also the very real chance of something terrible happening while wandering around with what is essentially a bag full of lightning rods. 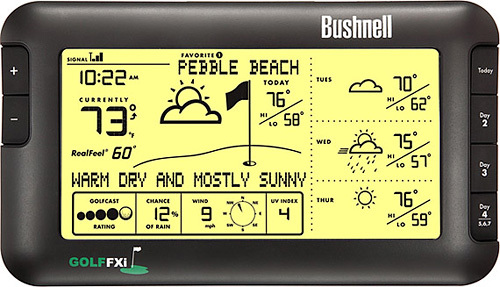 So before you head out on the links, you’ll want to make sure the weather’s going to play nice for 18 holes, and that’s where the Bushnell Golf FXi enters the picture. It receives constant weather updates for over 16,000 golf courses in the U.S. via a wireless USB transmitter attached to an internet-equipped PC, and displays them on its monochrome LCD. The weather data itself is provided by AccuWeather.com and includes everything from current, RealFeel and forecasted high and low temps, morning, afternoon and evening forecasts for up to 3 days, the UV index and even wind speed and direction. And as an added touch, the backlight on the display changes color to reflect the current temperature of your selected course so you can easily get an idea of the conditions at a quick glance. It’s a nice gift idea for a golf nut I suppose, but for $124.99 it’s kind of an expensive unitasker. By Andrew Liszewski on 05/26/09 • Leave a comment! The only thing worse than having to carry an umbrella on a rainy day is having to carry one around when it doesn’t end up raining. But you’ll feel less upset about the situation if you carry this Off The Course Umbrella designed by Sebastian Errazuriz. He originally came up with the idea while living in Scotland where he often found himself having to carry his golf clubs and an umbrella at the same time. So to make life easier, he simply combined the two. 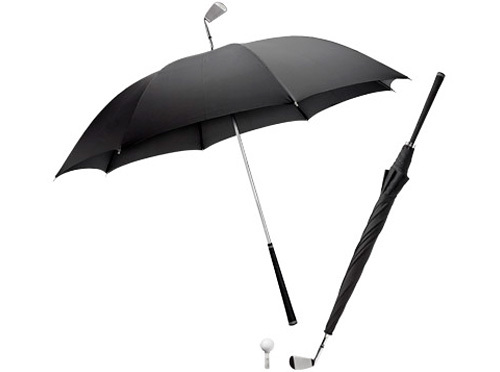 The Off The Course Umbrella is made of steel, fiberglass, polyester and rubber, and according to the MoMA Store website it’s more umbrella than golf club and shouldn’t actually be used to play golf. But I’d like to see them try and stop me the next time I’m waiting for the tram and decide to practice my chip shot with a pine cone or a soda can. $65 at the aforementioned MoMA Store. By Andrew Liszewski on 09/19/08 • Leave a comment! 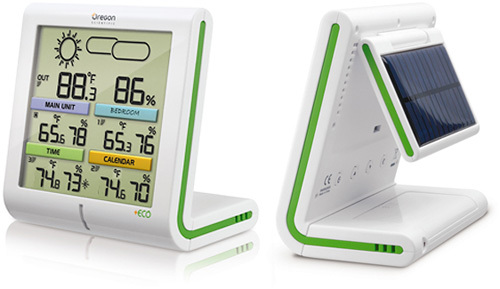 It’ll be a long time before another company manages to wrangle the title of ‘Most Prolific Home Weather Station Maker’ away from Oregon Scientific, and to ensure they stay well ahead of the pack, the company has just released a handful of new models. This one in particular caught my eye since it includes a USB upload function that allows you to send the weather data to your PC where you can keep track of weather changes and patterns over time using a piece of included software. The RMS600’s other features include an auto-setting clock that uses the atomic time broadcasts, indoor and outdoor temperature and humidity measurements, a 12 hour forecast, weather warnings which include ice, heat, storm, fog and frost alerts and it will even show you the current phase of the moon. The main unit is powered by 3 AA batteries while the remote sensor that goes outside requires just one. At the moment the RMS600 is still listed as “Coming Soon!” on the Oregon Scientific website, but when available (not sure when that is exactly) it’ll have a price tag of $89.99. By Andrew Liszewski on 08/13/08 • Leave a comment! There’s nothing worse than going camping only to have the weather not co-operate. (Well, maybe being attacked by a bear might qualify as worse.) And while this handheld altimeter from Oregon Scientific isn’t going to change the weather in your favor, it will at least you keep informed as to what the conditions will be like in the next 12 to 24 hours so you can plan your outdoor activities accordingly, or simply throw in the wet towel and head for home. In addition to weather forecasts, the easy-to-read LCD display also provides information on your current altitude, barometric/sea level pressure, a digital compass as well as a 12/24 hour clock with alarm and calendar functions. It even includes an LED flashlight and an electroluminescent backlight function, and is water resistant up to 164 feet. It comes tethered to a carabiner which can be easily clipped to your jacket or backpack and is shock resistant up to 3 feet if you, or it, happens to take a nasty fall. You can get it directly from the Oregon Scientific website for $79.99. By Andrew Liszewski on 06/24/08 • Leave a comment! One of the things I really liked about the now-defunct MSN Direct service was the weather forecasts delivered directly to my over-sized watch. 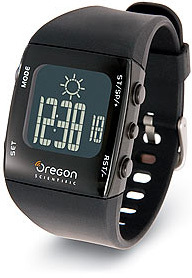 But I guess this Meteo Watch from Oregon Scientific might be an adequate alternative. Instead of downloading weather data from an over-the-air broadcast, the watch measures and analyzes barometric pressure trends in order to provide a somewhat accurate forecast for the next 12 to 24 hours. The reverse LCD display will show one of 4 “easy-to-read” icons including sunny, partly cloudy, cloudy and rainy. The Meteo watch also features a stopwatch function that will run for up to 60 hours, calendar and alarm functions, a backlight and is water resistant up to 30 meters. It’s available on the Oregon Scientific website for $69.99.